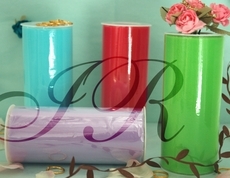 Tulle spool, spool tulle or tulle roll, also known as narrow tulle. 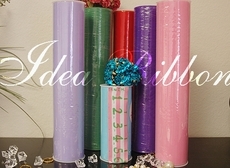 Come with 6 different size from 3" wide, 6", 9", 12", 18", and over 30 colors and styles to choose from Idea Ribbon supplies various sizes of tulle spools, such as 3" wide, 6" wide, 9" wide, 12" wide and 18" wide x 25 yard long tulle spools or tulle ribbons. 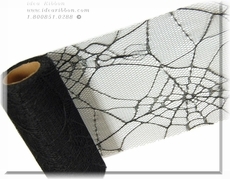 These tulle spools are made of fine fabric, the material is made of 100% nylon, not cheap hex-net material. 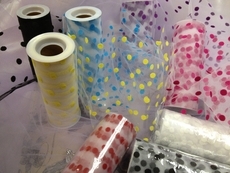 There are many uses for these tulle spools, such as designing tutus, for decoration purposes, and gift-wrapping. Tutu makers like our tulles very much to create their fabulous dance wear because the sizes are already pre-cut, so it is very simple to create a tutu! Making a tutu is as easy as 1, 2, and 3. 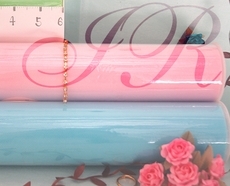 In the next paragraph, it will tell you how to make your very own tutus! First of all, make sure you crunch your tulle together really well to have a really full tutu! I suggest you use about 20 yards of tulle to create the tutu. 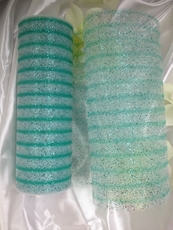 I recommend 6 inch tulle works really well, but you can try all different sizes of tulle. After you find the tulle you will be using for the tutu, you must measure your waist, make sure you measure whoever is going to wear the skirt and then take off 2-3 of elastic. 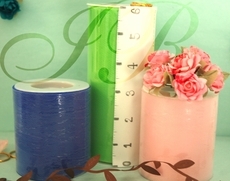 After you measure the waist for the tutu, sow the elastic together. 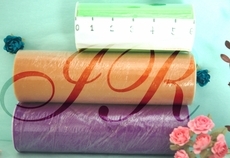 After you have finished with the elastic, measure the amount of tulle you will need to create the tutu. I recommend 22-24 inches in length so when you fold it in half, it hangs long enough. Gather small amounts of the tulle in the middle first and scrunch it together to give the tutu that layered look. Then do a slipknot with the tulle wrapping around the elastic. Make sure the tulle is tight around the elastic. Then repeat the process around the entire band of elastic to finish the tutu. Then there you have a tutu!